No surprises there. Rumors of an “inevitable” Greek exit brought on risk aversion sentiment, and AUD/USD and NZD/USD in the first half of the year to the tune of 700 pips per pair. Fortunately, the comdolls were also on the risk appetite bandwagon in the second half of the year when Super Mario Draghi vowed to do “whatever it takes” to save the euro. The Fed’s actions were no small matter for the high-yielding comdolls either. Rumors of the Fed implementing non-QE measures added to the comdoll bulls’ drive around the middle of the year, while its implementation of QE3 all but sealed a profitable year for the Aussie and the Kiwi against the dollar. 2. Commodities? Nah. It’s all about China! Though AUD/USD still closely tracked spot gold prices for most of 2012 (check out my cool chart above! ), gold and other commodities prices didn’t influence Aussie and Kiwi trading as much they did last year. Remember that Australia is one of the biggest gold producers around, making its currency sensitive to gold prices as it determines how much Aussies are needed to buy gold. Instead, both the Aussie and the Kiwi were more sensitive to China’s economic reports. After all, China is the largest trading partner to both Australia and New Zealand. This is why concerns of the Chinese economy experiencing a “hard landing” helped drag the comdolls to their yearly lows this year. Fortunately, Chinese data began to steadily improve around the last quarter of 2012, which helped the Aussie and Kiwi recover most of their yearly losses. 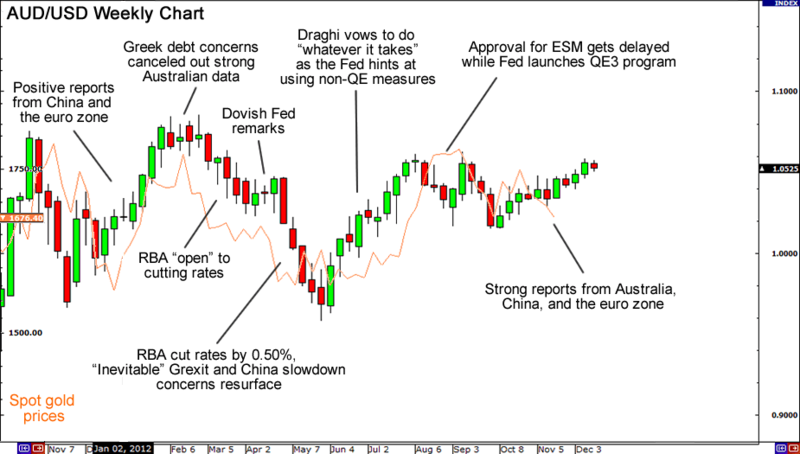 You can’t discount central bank policies when reviewing price action! The Reserve Bank of Australia (RBA) kept investors at the edge of their seats each month as they decided how often and how deep it wanted to cut its interest rates. They didn’t do it for fun though. The RBA fiercely protected its economy, slashing interest rates left and right in order to prop up its housing industry and protect exporters from an expensive local currency. The Reserve Bank of New Zealand (RBNZ) is on the same boat as the RBA. But though the RBNZ kept its rates steady at 2.50% FOR THE WHOLE YEAR, it doesn’t mean that it wasn’t vigilant over New Zealand’s economic reports. In fact, it has already warned that it’s not happy with the Kiwi’s high prices. If New Zealand’s economic data continues to surprise to the downside as they have been doing so for the past couple of weeks, then it’s only a matter of time before we see more action from Australia’s closest neighbor. 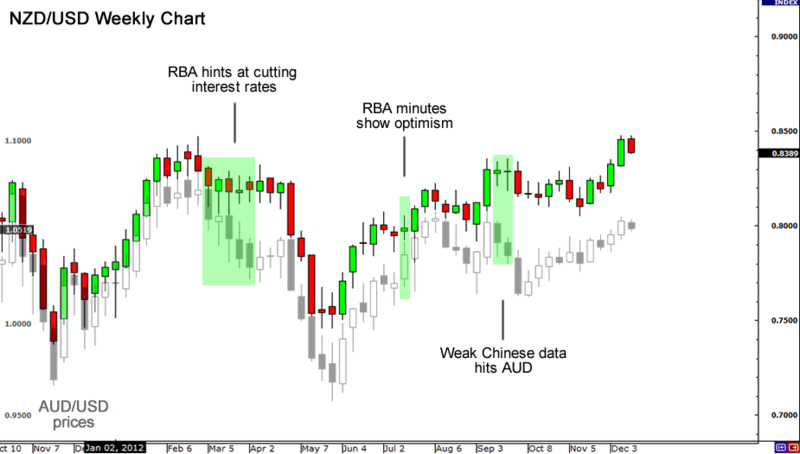 Despite the contrast in the RBA and RBNZ’s policies this year, AUD/USD and NZD/USD kept a tight correlation all throughout 2012. Heck, the only times when their prices weren’t in sync was when the RBA aggressively pulled one of its interest rate stunts or when China hurt the Aussie’s price action too much. But will the correlation remain in 2013? For all we know, something big might happen in gold prices enough to rock the Aussie and the Kiwi. Or maybe we’re in for more of the “Simon Says” game with risk sentiment. In any case, make sure you keep close tabs on the twin powers of the comdoll world in 2013! Which among the following influenced comdoll price action the most?